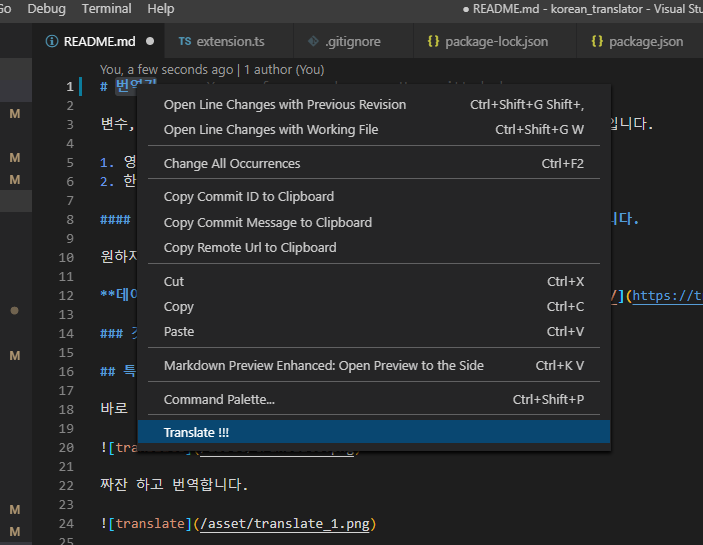 Visual Studio Code>Other>Korean-translatorNew to Visual Studio Code? Get it now. 변수, 함수, 클래스 이름이 영어로 생각 안날때 편하게 번역해주는 플러그인입니다. Variables, functions, and class names are not translated in English. 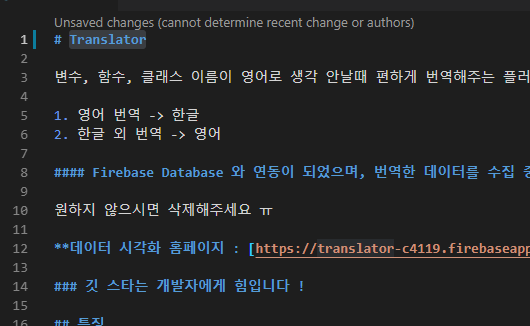 Firebase Database 와 연동이 되었으며, 번역한 데이터를 수집 중 입니다. It is linked with Firebase Database and is collecting translated data. Please delete it if you do not want it. Git Star is to the developer's power !!!!!! 현재 Naver API 를 이용한 언어 감지 및 영어로 변역 입니다. 한글이 아닌 다른 언어를 번역해도 영어로 결과가 나옵니다. 만약 영어를 번역 시 한글로 나오는 기능도 추가했습니다. 배포 후 허용량이 자주 초과되면 그 후에 수정을...해보도록하겠습니다.